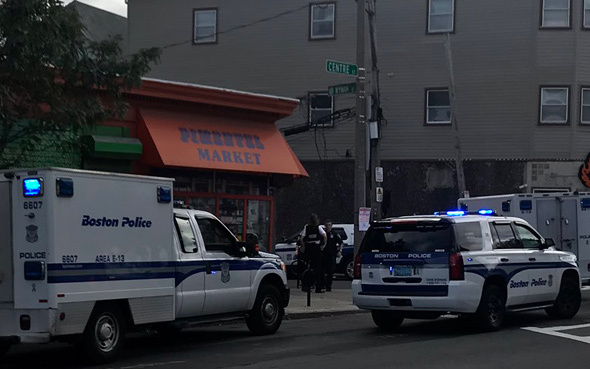 A woman and a man were shot inside the Pimentel Market on Centre Street at Wyman Street around 2:45 p.m.
First responders found the woman at the store, but the main fled before they arrived. He turned up later at a local emergency room. On Twitter, Maul Panafort reports hearing about six shots. It's the second shooting inside a store in Jamaica Plain in several days. On Saturday, a man was fatally shot inside the Professional Barber Shop on South Street. I've been going to that store since the 1980s. This makes me sad because sometimes I like to hang out and chat with the owner. I heard another report indicating that the shots were fired from outside the store as the target (the man who fled) was leaving the store. Bullet proof glass stopped the bullets from going inside.